Future Hall of Famer Antonio “The Magic Man” Tarver (31-6-1, 1 NC, 22 KOs) has just about done it all as a boxer having been an Olympic medal winner and world champion as an amateur, along with capturing five major light heavyweight world titles as a professional, as well as a pair of The Ring magazine’s top honors, and four other world championships in two different divisions. Tarver was a highly decorated amateur who had an amazing 158-12 record. He is the only boxer to capture gold medals at World Amateur Championships, U.S. National Championships and Pan-American Games in the same year (1995). 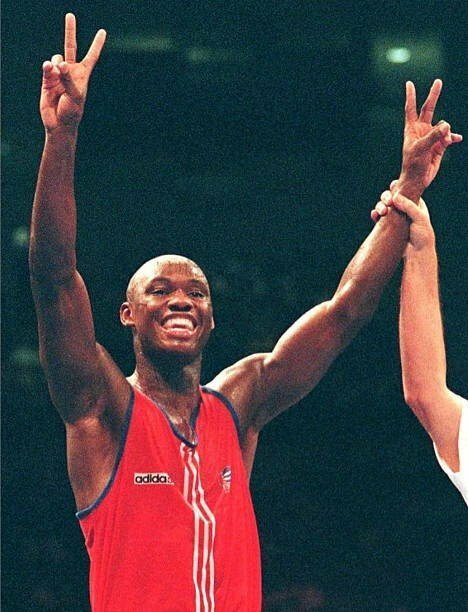 The Orlando, Florida-born southpaw won a bronze medal at the 1996 Olympics in Atlanta, losing in the quarterfinals to future world champion Vassiliy Jirov, who Tarver had defeated in the semifinals of the 1995 World Amateur Championships. Tarver also won top honors at the 1994 National Golden Gloves Tournament and 1995 World Championships Challenge. “I went on a winning roll in 1995 and went into the Olympics in rare form,” Tarver said. “And that’s why I was favored to win a gold medal. I was hitting him (Jirov), the same guy I’d beaten in the World Championships, but no points were registering for me. I had a good second round, but I was down three points, so I threw my game plan away in the third round. I felt I had to do more and got away from my style: counter punching, not getting hit, and being patient. I thought I had won and so did a lot of people. I made up for that, though, with a gold-medal professional career. “I had been faced with a decision about going pro after I was beaten in the ’92 Olympic Trials. I decided to stay in the amateurs, despite not having any guarantees about making the 1996 U.S. Olympic Team. I sacrificed four years of my pro career, which is why I turned pro at a relatively late age (27). I was determined when I found out the 1996 Olympics were in Atlanta. I think I made the right decision and I have no regrets. “I had always dreamed of going to the Olympics. I saw Roy Jones, Jr – we first fought each other at 13 – get robbed of gold. I was watching that on television, jumped up, and knew where I was heading: The Olympics! We both suffered horrible decisions in the Olympics and I knew then that our careers would be parallel. Tarver made his pro debut February 18, 1997 in Philadelphia, stopping Joaquin Garcia (4-0) in the second round. Nobody was able to beat Tarver, at least until his 17th pro fight, when Eric Harding defeated Tarver by way of a 12-round unanimous decision. Two years later, Tarver embarked on a 12-fight murderer’s row stretch during the next seven years, arguably establishing him as the No. 1 pound-for-pound fighter in the world. It all started with a successful rematch with Harding (21-1-1) in Indianapolis, when Tarver dropped Harding in the fourth round, plus twice more in the fifth, on his way to a fifth-round technical knockout to avenge his lone pro loss to that date. Next up for Tarver was a showdown with 44-3 Montell Griffin for the WBC and IBF 175-pound division titles, which were vacated by Roy Jones Jr., April 26, 2003 at Foxwoods Resort Casino in Mashantucket, Connecticut. In his first world title shot as a pro, Tarver pitched a complete shutout, decking Griffin in the first and last rounds to shut out his opponent by scores of 120-103 from all three judges. Seven months later, however, Tarver lost a controversial 12-round majority decision and his WBC crown (he was stripped of his IBF belt) to WBA Super and IBO champion Jones in Las Vegas. The following May at the venue, Mandalay Bay in Las Vegas, though, Tarver became the first to knockout Jones, putting him to sleep in the second round. Tarver then became a mainstream celebrity, appearing on late-night shows and covers of The Ring magazine and KO Magazine, and co-hosting an ESPN Friday Night Fights telecast. The WBC stripped Tarver of his title in 2004 for fighting IBF champion Glen Johnson (41-9-2) instead of the WBC mandatory challenger. Johnson, ironically, was stripped of his IBF title for the same reason right before his fight in Los Angeles with Tarver. Tarver and Johnson fought for The Ring and IBO titles and Johnson won a 12-round split decision. In their rematch six months later in Memphis, Tarver won a unanimous 12-round decision over Johnson to capture the IBO strap. Tarver completed his trilogy with Jones, retaining his IBO title with a unanimous 12-round decision (117-111, 116-112, 116-112). Tarver lost a 12-round decision June 10, 2006 in Atlantic City to Bernard Hopkins for the IBO championship, which was soon vacated and recaptured by Tarver with a 12-round majority decision over Elvir Muriqi (34-3). Tarver traveled to Australia in 2011 to challenge IBO cruiserweight champion and local hero Danny Green, who retired after nine rounds, as Tarver added another title belt to his display case. In December of 2013 in Temecula, California, Tarver knocked out Jonathon Banks (29-2-1) in the seventh round, and Tarver’s last fight was a 12-round split decision draw with former world champion Steve Cunningham (28-7) in Newark, New Jersey. In 2006, Tarver starred as Mason “The Line” Dixon, the heavyweight champion in the film, Rocky Balboa. Tarver, as he marches towards his planned history-making performance by becoming the oldest heavyweight world champion of all-time, also has served as a color commentator in boxing for Spike TV and Showtime. Today, at the age of 49, Tarver is still technically active, and he also trains his son and undefeated middleweight prospect, Antonio Tarver, Jr. (5-0 (4 KOs), where they live in Tampa, Florida. Although at the age of 49 he is still an active fighter, Tarver occassionally does some color commentating and he trains pro and amateur boxers at a gym in Tampa, Florida. “I’m not retired as a fighter,” Tarver commented. “I started a program, ‘Train with The Champ’, and it includes room rent and training. I like to say it’s an AirB&B for boxing. I train my son (5-0 middleweight Antonio Tarver, Jr. there. I learned a lot from my early days, training in Orlando with my coach, Lou Harris, and I reunited with Jimmy Williams, who is 90 now, training my son together in Tampa. Tarver also is an advocate of the relatively new “USA Boxing Alumni Association,” which was created to champion a lifelong, mutually beneficial relations between USA Boxing and its alumni, –boxers, officials, coaches and boxing fans — the Alumni Association connects generations of champions, inspiring and giving back to USA Boxing’s future boxing champions, in and out of the ring. “I’m going online to join,” Tarver said. “I’m looking forward to attending an Alumni Association meeting, June 24-30 during the Junior Olympics in Charleston, West Virginia. Everything that goes around, comes around, in USA Boxing. Just ask future Hall of Fame candidate Antonio Tarver.